Haven't seen a topic like this on here yet, but if this is in the wrong place mods feel free to move it please. 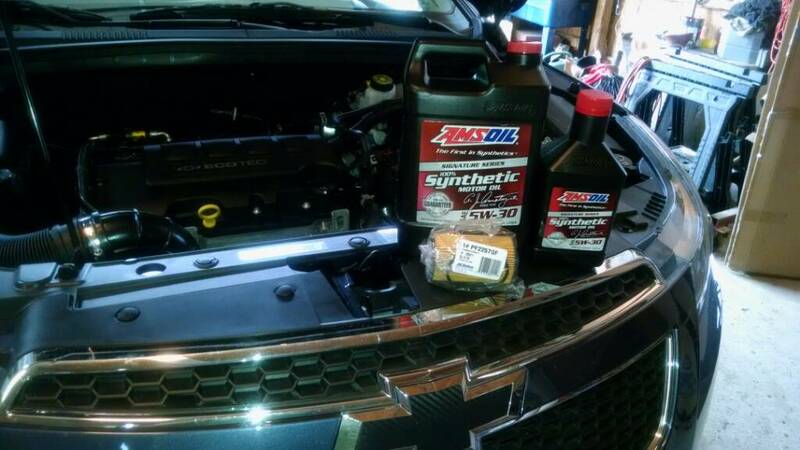 Anyhow to stick with the topic I did my first AMSOIL oil change today. brian v, Sunline Fan, trevor_geiger and 5 others like this. I Whipped IT , Whipped IT GooD ! ITLoves a Good Whipping on Tuesdays , Especially when those pessky school busses have to slow down to a crawl at 4 PM rush hour traffic ..
Starks8 and dhpnet like this. Hey Daryl how much did that oil cost you and how much quarts does the car take? Also how many miles between oil changes? I heard Amsoil goes longer? True? Is it an easy car for oil changes to do yourself? PM Xtreme so he can tell you his prices as he doesn't advertise those prices outside of a PM or FB message. I'll possibly wash the car today or at least vacuum and wipe the insides down. p.s. if we find a thread similar, let us know and we'll just merge the 2. Daryl and Mo Cruze like this. Off topic but related to oil changes. All my oil changes have been done at the dealer, even though I've had 6 wix filters sitting on the self in my garage. Decided at 3500miles to spin off the filter and swap in a new one just to see how well it was holding up. I wasn't planning on using that new gasket but when I went to reinstall I noticed the gasket was so stretched it was sticking out of its groove significantly on once side. Swapped on the new filter lid gasket, it had a nice tight fit. Got to thinking, my previous car 2.2 ecotec with similar filter only the aftermarket filters came with a new gasket, the AC delco ones did not. Is my dealer not changing this? Does the Cruze AC delco filter not come with a new gasket? As loose an worn as the one was on my car it certainly didn't look like it was ever changed, and I'm surprised it had not started leaking. Opened the hood, checked all the fluids, all are good, so just drove it. Took all about five seconds, oil is still clean and at the full mark. Thought about cleaning off the insects, but figure I will wait until I get a couple more, same amount of work. Today I logged in and thought about my Cruze. obermd, Sunline Fan, trevor_geiger and 6 others like this. Yesterday we had rain and more rain. Today will be wash and detail time. Tell your papa you'll be home when the good feelin' dies. brian v, NYCruze2012, trevor_geiger and 5 others like this. On rockauto site one of the filters did come with it and one didn't. As for dealership, they should have plenty in stock. If they did not change it, that's poor service practice. Best bet would be to ask XR what his looked like when he swaps it out between the extended oil changes. I got lazy and went to the car wash. I get another wash in on Monday with the package I picked. The windows should be good and clean by then. I need to get in and reposition the ATS horns. They seem to be louder than OEM and the pair on the Escalade causing stuff to rattle. Hopefully it's an easy fix.